With inquiry-based learning, middle school science students use experiments and discussion to stretch their thinking. Inquiry-based learning uses a central question to frame a curriculum unit or module. Students answer this central question for themselves, discovering and learning through a series of guided discussions, experiments, and hands-on activities over several class periods. Teachers find that students are more engaged in what they're learning, and have a wider context for understanding the material rather than just hearing a lecture or memorizing facts. Having kids engage in inquiry-based science lessons really provides them with a way to explore on their own. It removes the teacher as somebody who is providing them with information that they need to memorize. And instead, what the kids are really doing is they're experiencing, they're discovering as they go. And that’s what real scientists do. To design an inquiry-based module, teachers at Casey Middle School use a central question to frame a series of classes. Every class is then organized to help answer that question through readings, hands-on activities, group work, and student discussions. A good central question can frame several classes, or can even take weeks to answer as students work to piece together their learning and understanding of the subject matter. Each unit can have a central guiding question, or can be broken down even further into modules with mini guiding questions. "Would you recommend to friends visiting from out of town that they tube in Boulder Creek?" The kids see the creek as a place to recreate and have fun with their friends. But suddenly they're looking at it through a different lens. They're looking at it through a lens as a place where we're now going to be doing some sampling and some scientific thinking. During week one, students talk about the cycle of water in the Boulder community, the limited supply, and how it gets treated and reused by the community. Week two starts with a class lecture and discussion on the types of pollutants that might be in water. Later in the week, students are introduced to basic water tests and water sampling. They also begin to hypothesize and discuss what they think about the "answer" to the Boulder Creek question. Some students think the water is healthy because it is clear, and therefore safe to tube in. Others are not so sure. All observations and hypotheses are recorded in students' science notebooks. The week concludes with students going to the creek to sample and analyze the water. They use LaMotte water-testing kits and to test for things like dissolved oxygen, the pH of the water, and nitrates and phosphates. 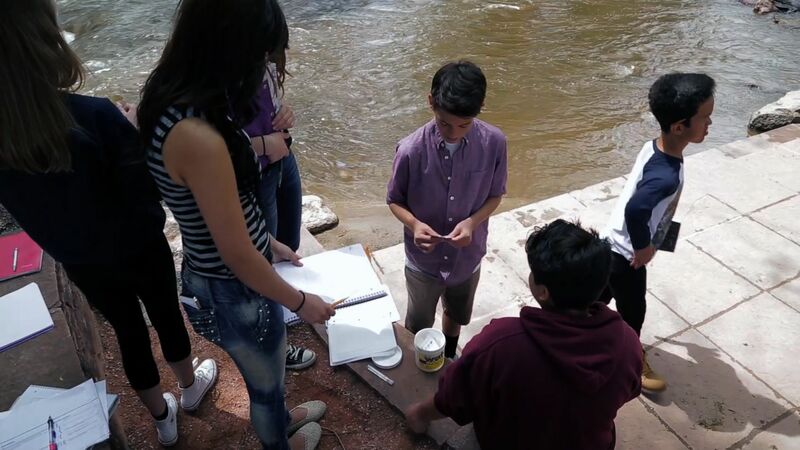 While at the creek, they compare their findings to a chart that gives them some qualitative measures of how much dissolved oxygen is in the water, and whether or not that falls into a healthy bracket. In addition, they record things like the day's weather, the air temperature, and the water temperature, all of which may affect the creek's water quality. During the third week, students compare their data with other groups, and start to get a picture of what's going on in the creek. They also start to work on their final presentations, a lab report, and an infographic (electronic poster) about their findings and conclusions, ultimately answering the question about whether they would recommend whether friends should tube in Boulder Creek. Inquiry-based learning utilizes hands-on learning, but not all the lessons pertaining to the central question are hands-on. Though hands-on strategies are often integrated, sometimes inquiry-based learning is about reading material, discussing it with other students, or doing some research. Hands-on learning (like we saw at Boulder Creek) is part of the experience, though not all classes will be hands-on in an inquiry-based learning unit.